This weekend Walker, Vienna, Walker's mama and I went to the farmers market. And yes that makes it two farmers market visits in one week! This time we went to one in Newmarket because it's close to Walker's mama's home. Vienna loved the splash pad at the market. She was pretty soaked, but fortunately I brought a change of clothes. These days, now that Vienna is potty trained, I don't go anywhere without a second set of clothes for her because accidents can happen. Even though the markets aren't abundant yet because it's still quite early for much of a harvest in Ontario, there was plenty of rhubarb and asparagus to be had. I was on a mission for rhubarb so it was perfect. 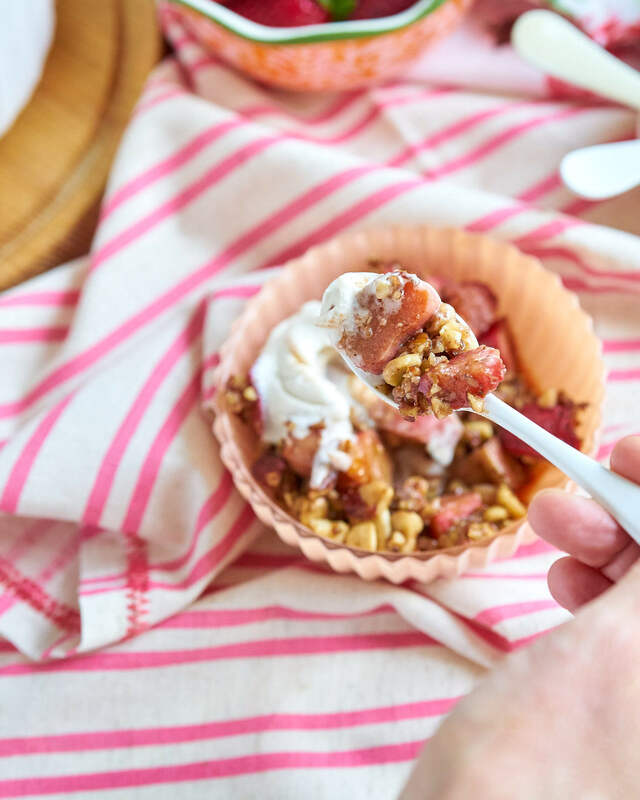 I bought two large bunches and had more than enough to make this incredibly delicious, flavourful and juicy Grain-free Strawberry Rhubarb Crisp. 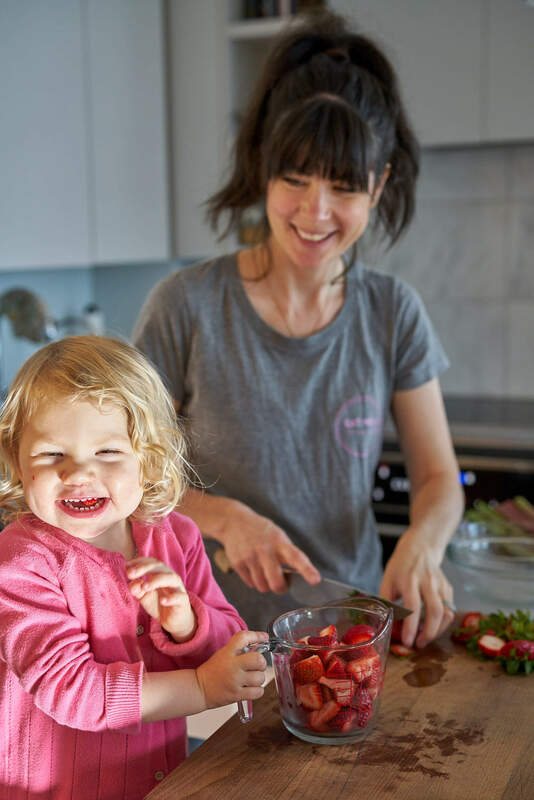 I'm having a ball in the kitchen these days now that Vienna always wants to help. She's a little bossy mind you, always wanting to take over, lol. Plus she likes to eat as she's cooking. In this photo she was literally saying "no mama, no mama, I want to eat them!". Her mouth is FULL of strawberries as she is saying "cheeeese". 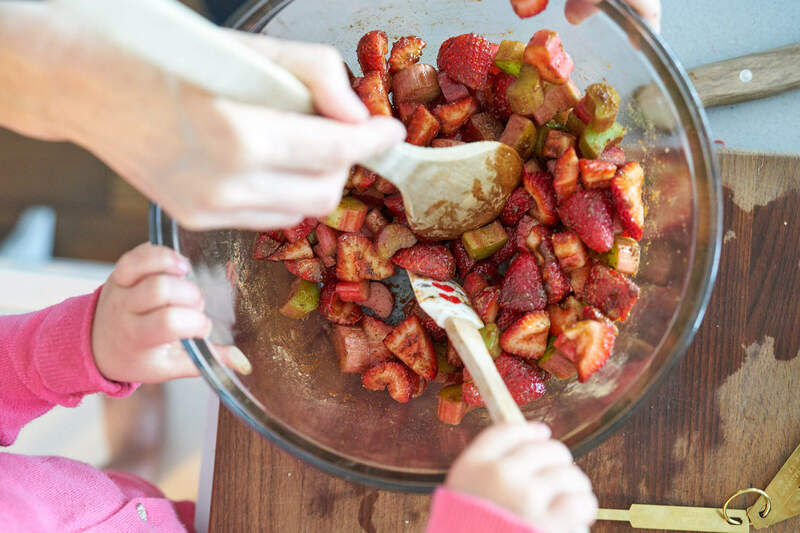 The reason I added strawberries is because if you don't add a sweeter fruit when baking with rhubarb then you have to add a ton of sugar because rhubarb is quite bitter. It's easy to find organic California strawberries right now. In fact, I got two pints for $5 today at my local health food store -- that's a steal! I still added some cinnamon and coconut sugar to the fruit to ensure it was nice and sweet, but not too sweet of course. 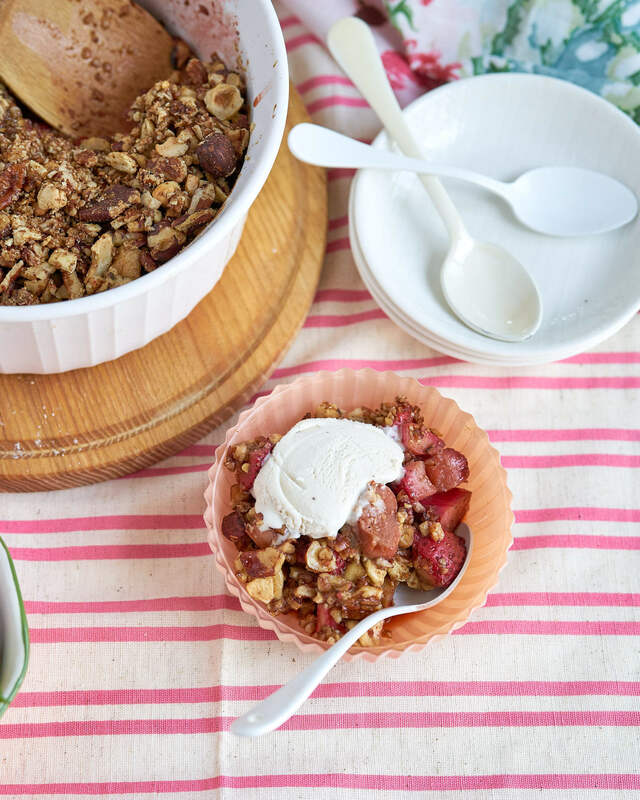 As for the topping, I don't eat a many grains which is why I wanted to create this recipe as grain free with a super flavourful nut and spice topping. If you have a nut sensitivity in your home, then you're best bet for a topping is to use oats or quinoa flakes. The nuts really balance out the carbs from a blood sugar perspective but you're on your own once you add your choice of ice cream, haha! 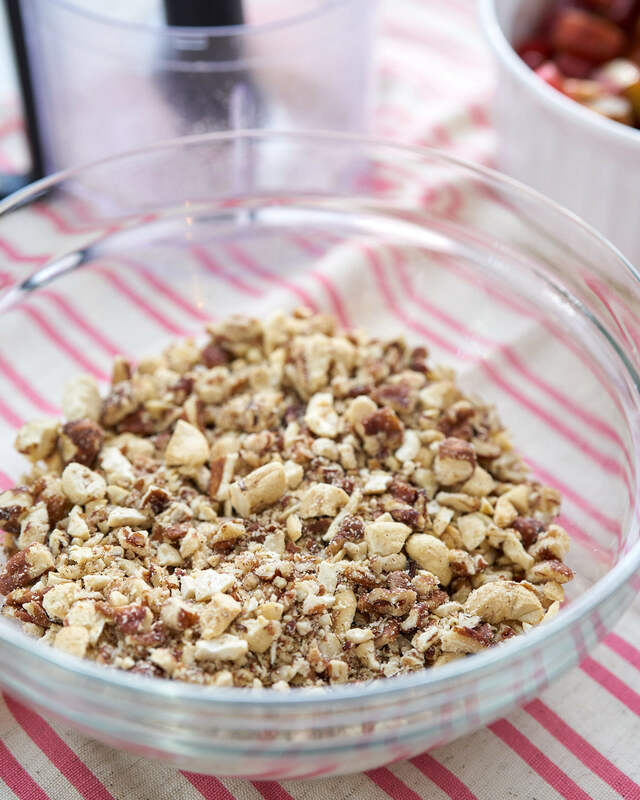 This crisp topping was incredibly flavourful from the spices and the nuts, with a nice schlop of vanilla coconut milk ice cream you'll be in heaven! Another ingredient that added to the flavour profile was the butter. Now of course normally I use coconut oil, but as I was about to add coconut oil I realized I purchased a MASSIVE jar of "refined coconut oil". Ugh, I'm so annoyed with myself. I never use it because it has no flavour as it's been deodorized (definitely avoid refined). So butter it is! As you will see in my notes you can use coconut oil or butter. I have nothing against butter, I just tend to use coconut oil more often. 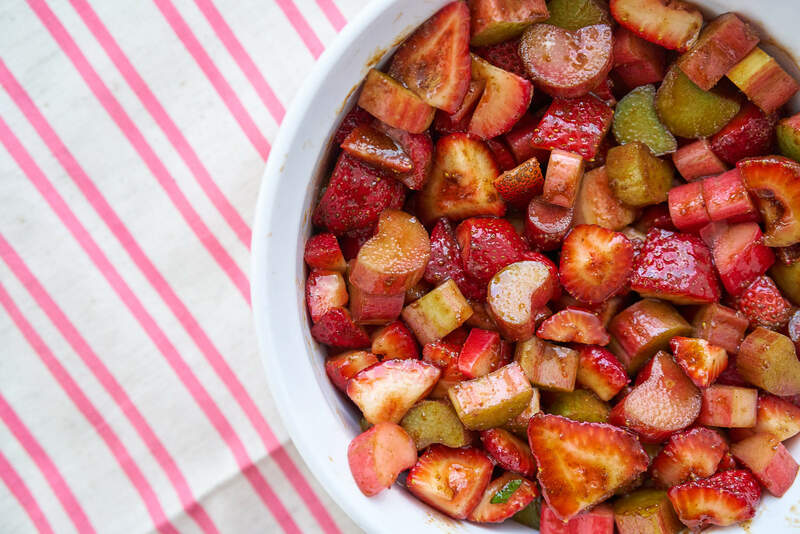 I'm gonna get to this recipe now, but last thing I wanna say before I do that is that rhubarb and strawberry is a match made in recipe heaven. Beyond flavour, they are both incredibly rich in phytonutrients for heart health and have tons of fiber for colon health. This recipe is gluten-free, grain-free, dairy-free if you use coconut oil, vegan and totally awesome amazing! Don't you love how the rhubarb looks like little hearts? 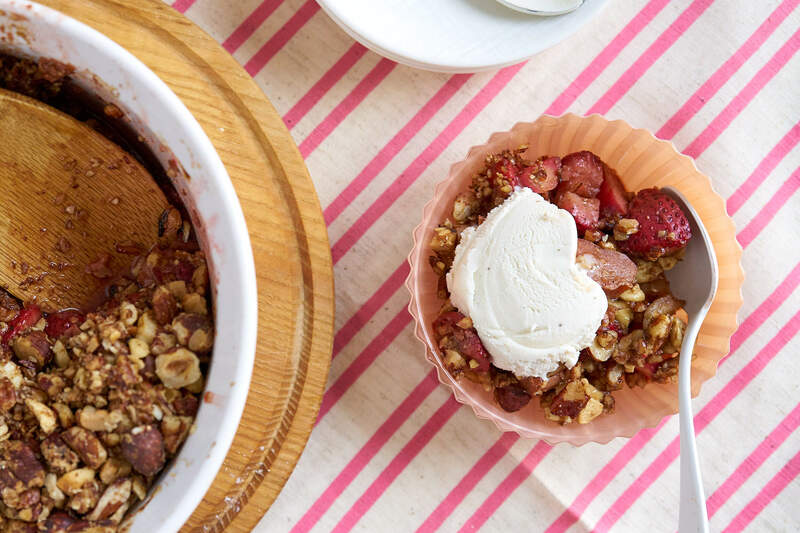 Here's the recipe for Grain-free Strawberry Rhubarb Crisp! Preheat oven to 350F degrees. 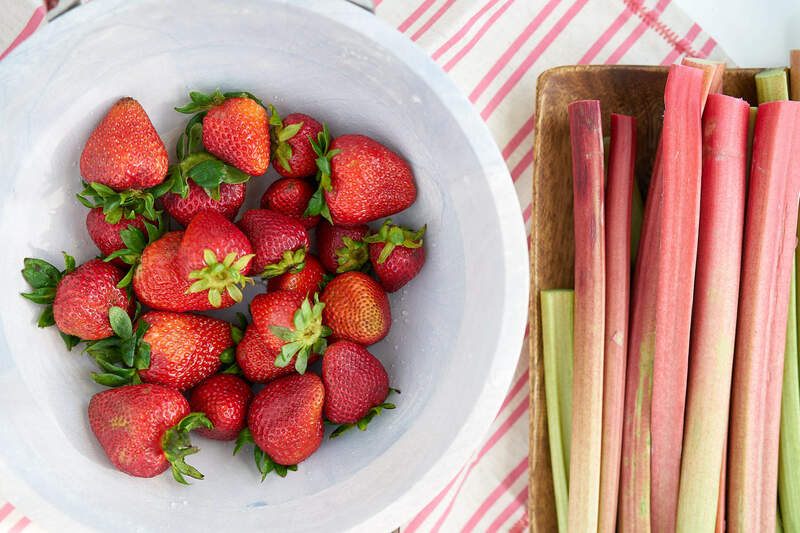 In a large bowl, combine strawberries, rhubarb, coconut sugar and cinnamon. In a separate bowl make the topping. Combine the ground nuts, cinnamon, nutmeg, coconut sugar and butter or coconut oil. Place the fruit mixture into a baking dish. I used a 6 or 7 inch white ceramic round dish. Evenly spread topping across fruit. Bake for 30 to 35 minutes or until the rhubarb is fork tender. Just be careful you don't burn the nuts. If they look like they are getting too crispy, just cover the dish with tin foil. 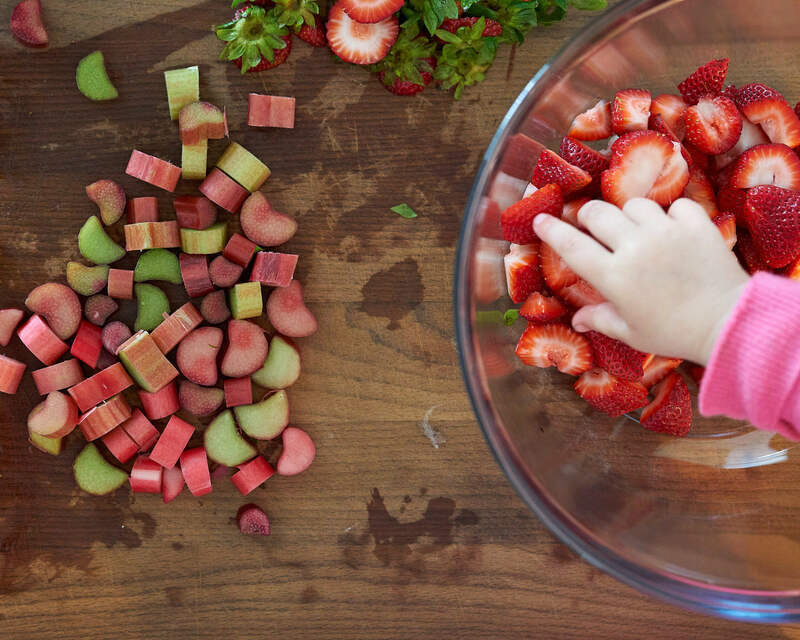 NOTE: Keep in mind rhubarb is very water dense and a lot of water will come out as it cooks. This is normal to have lots of rhubarb/strawberry juice at the bottom of your pan. It tastes lovely when it's all mixed together and you've added a dollop or schlop of ice cream. Enjoy! *You can use whatever nuts you have on hand. I tossed three different kinds into my mini food processor and blitzed for 5-10 seconds. **I just cut the butter into crumbly bits but don't worry about perfection here, it's going to melt and mix in to the crisp anyhow. And please, enjoy it with some vanilla ice cream. I often buy Coconut Bliss ice cream or from my local ice cream shop Delight. I hope you enjoy this recipe as much as we did! Have a joyous day friends! 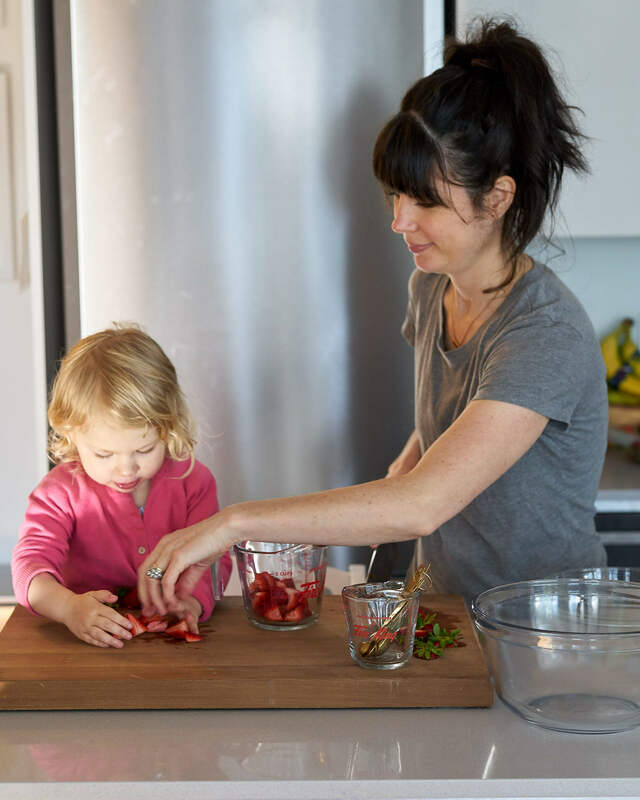 I was very much hoping you’d do a strawberry rhubarb crisp recipe! :) can’t wait to make it! I cannot wait to make this! Your recipes are always so delish!!! Help! I use refined coconut oil because I dont want my food to always taste like coconut. I have Non GMO Spectrum Organic brand. Is it ok? 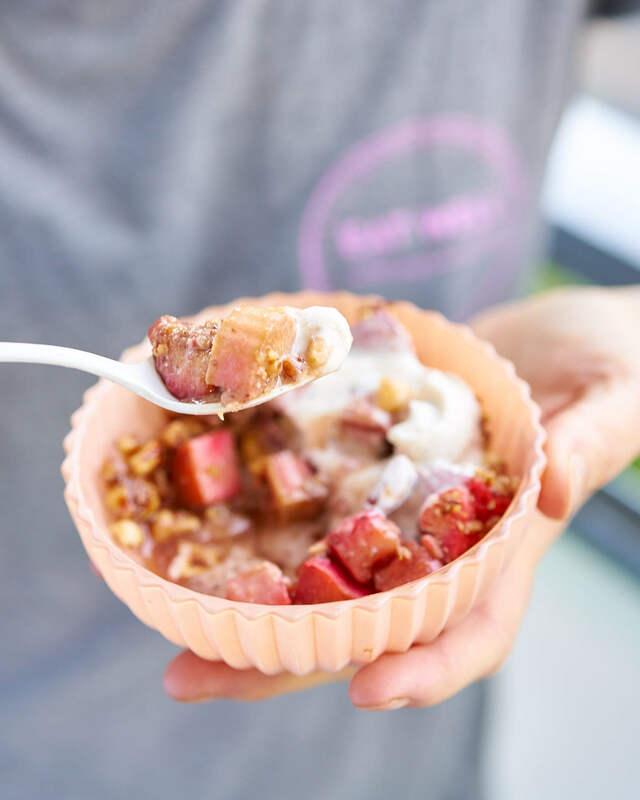 And aside from my concern on the oil, I do appreciate your seasonal rhubarb recipe so thx! Enjoy the recipe Jenny! I'm really not a fan of refined oils because of that very word "refined". When an oil is refined, some of it's nutritional properties will be lost. The question really is, how exactly do they refine the oil. If it's certified organic then hopefully it's a cleaner refinement process because conventional oils have been exposed to toxic chemicals through the process of refinement. However, organic or not, numerous phytonutrients will be lost when the taste is removed and you have a less nutritious oil. Phytonutrients are what give plant foods their taste, texture, odour, colour etc. Remove taste and odour and you remove nutrition. When I want a non-coconut tasting dish, I use extra-virgin olive oil. Avocado is another neutral tasting oil you could use. Hope that helps! Aw, your daughter is so adorable! As rhubard is quite bitter, I often use it as an ingredient for my salty dishes. Your recipe seems interesting, this combination will keep the flavour balance. Next time, I'll try it! Thank you so much Natalie! Agree, that's why you have to add some coconut sugar and if your strawberries are nice and sweet you've got a match made in heaven! I hope you try it out, enjoy! This looks absolutely delicious! I can't wait to make it with local strawberries! I hope it turned out great for you Leslie! How did you like it? Can you make this vegan? Hi Michelle, you sure can! See my recipe for options.